Is eye cream really that important? Yes, it is! The skin around the eye area is thinner and special formula is needed for such area. Normal cream which you use for face might not be lightweight enough and it can cause a milium cyst also known as milia - the tiny white dots around the eye area which are really annoying. Due to the thinner skin in the eye area, wrinkles can show up quicker if moisturizing this part of your skin is not in your routine - the skin gets dry quicker than a skin on your chin or cheek. Obviously, we have some genetical predispositions - it's all about eye shape and how our eyes are built, we can't really stop ageing but we can make skin ageing slower. Eye cream vs eye serum? As long as routine build out of couple products and using a moisturizer after serum on the face has lots of sense, in case of eye creams and eye serums, it might not be always a good choice - as I said before too heavy formula can cause milia and we want to avoid that so if you're young choose one formula - eye cream or eye serum, usually serums aren't as heavy as eye creams but they are better concentrated than creams, if you're a young person - choose one formula serum or cream to prevent wrinkles and dry skin, if you need stronger formula for mature skin - using eye serum and eye cream might be more effective. 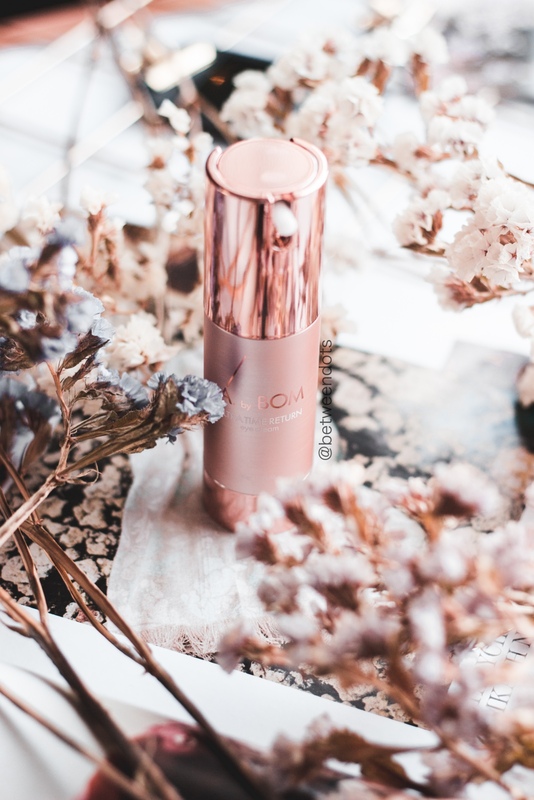 The main reasons why I use eye cream and how did the testing process go? I started to use eye cream when I was 18 or 19 I guess, that's something strange for my friends but for me, eye creams seem to be very natural. I spend whole days in front of the computer - editing photos, videos, writing posts, working or even studying since I took distance learning and I'm doing my best to get new skills in languages and programming. The moment when I tested this duo was the worst for my eyes - I worked for 8 hours daily and sometimes I had 1-2 hours of sleep per day, it's not a healthy lifestyle and to this day I have some health problems like having a back problem. I started to test serum during the summer and from October I started to test eye cream to give you the best results. Why I didn't start using them together? Because I wanted to see the effects. This product is really a small green gem! The packaging is made out of glass and it has pipette which makes application easier. 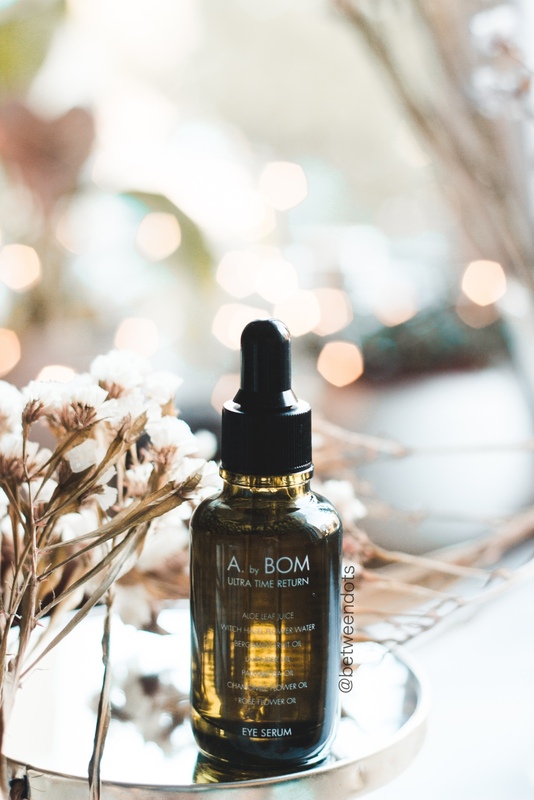 The texture reminds me of facial oil and it makes the skin looking like a glass that's why I use it also on my cheekbones when I need this 'natural' glow. I didn't mention the amazing fresh scent which is one of the reasons why it got my heart. 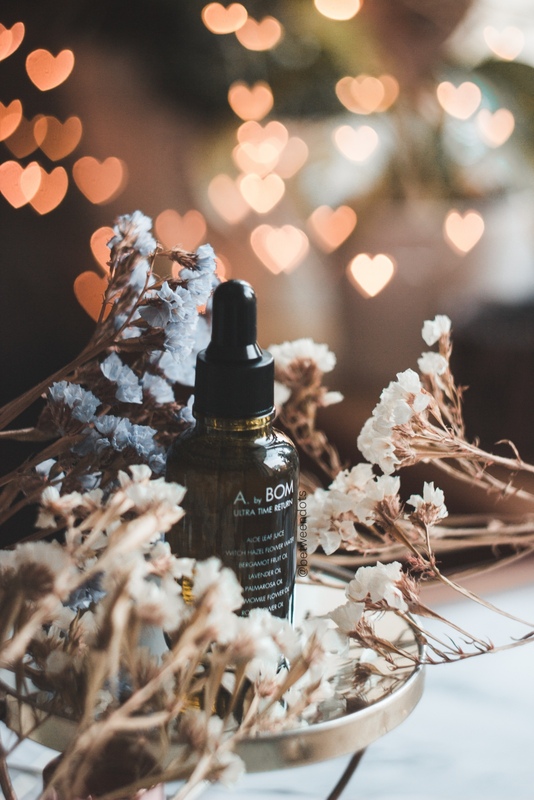 I can share with you a small trick - when you're out of a highlighter, just scratch a bit of shiny eyeshadow - something with tiny dots of glitter and mix it with a one or two drops of this oil - that's how you make a highlighter when you're out of one. But let's look what's inside because the packaging might look awesome but the inside of the product and effects are the most important. Aloe Barbadensis Leaf Juice is first of the ingredient that catches the eye, an incredible moisturizer and calming ingredient, the next ingredient - Camellia Sinensis Leaf Extract, an antioxidant helpful in anti-ageing skincare, is also soothing so this mix is all you need after hours of working in front of the computer. Vitamin B3 also known as Niacinamide is a brightening and anti-ageing ingredient. Adenosine is one of my favourite ingredients because it makes the wound healing quicker and it improves the firmness of the skin. Another interesting ingredient on list - Magnesium Ascorbyl Phosphate is also known as MAP, it's a stable form of Vitamin C used as a brightening ingredient. We have here peptides as well as Palmitoyl Tripeptide-5 and Acetyl Hexapeptide-8, not everyone enjoys peptides but some of them can improve the collagen production or even fake the effects of botox. Besides that, you can see here Panthenol, Glycerin and many other good ingredients. 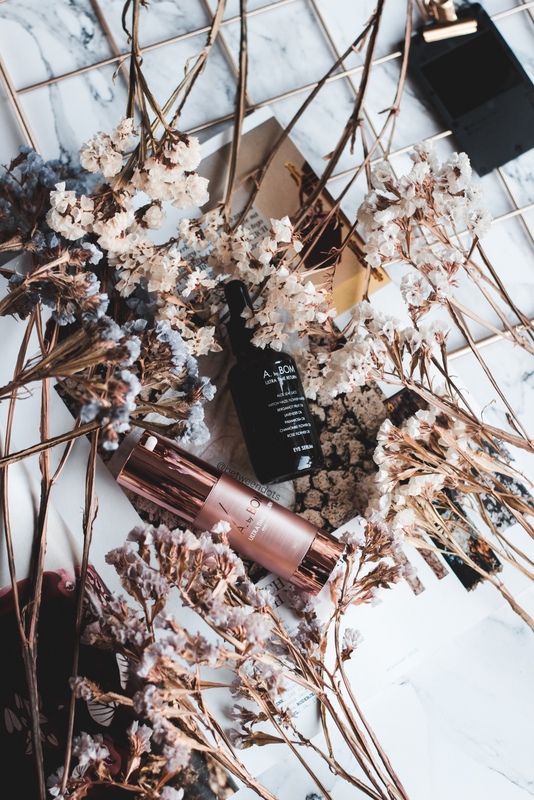 Obviously, it would be too perfect, there are some ingredients that you might not like, for example - PEG-6 Caprylic/Capric Glycerides, Peg-150 Distearate, Disodium EDTA but also Stearic Acid that is not the best choice for oily skin or Lavandula Angustifolia (Lavender) Oil which can be sensitizing. Overall, I really enjoy this product. The scent of it is nice and it really does brighten my skin. It literally saves me when I have days in which I sleep 2-6 hours and I feel like I'm half-dead. It's very gentle oil good for eye area massages, after a long day of work it was all I needed. 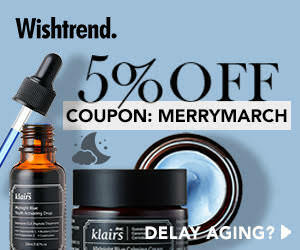 It's hard for me to talk about wrinkles since I'm still young but for 25 years old this serum should be all you need. The only thing I need to mention - the serum is bit sticky and it needs couple minutes to get absorbed so not everyone will like it. The amount of ingredients in this cream is big but still, it didn't beat A.H.C. The Real Pure Eye Cream For Face - the review of it you can find on Kherblog. I didn't want to change my eye cream at first since after so many months with A.H.C. it feels like we're a duo that you cannot separate but sometimes it's good to give a chance to the new products. This cream has a beige colour and quite a neutral scent. The texture isn't heavy and a pea-size amount of this cream is enough. But what makes this cream interesting? We can see here some ingredients used also in eye serum like Niacinamide but this cream offers more than serum like moisturizing ingredients and antioxidants like Glycerin, Sodium Hyaluronate, Squalane, Ceramide NP, Cholesterol, Centella Asiatica Extract and Vitamin E. There's also a Palmitoyl Pentapeptide-4 - another peptide which is really useful for fighting wrinkles. Saccharomyces Ferment Filtrate surprises me here a lot, the fermentation process make the ingredient easier to get absorbed by the skin. This product is full of amazing ingredients but let's talk about ingredients that some of you prefer to avoid. I haven't seen fragrance in the previous product because it took the scent from oils but here we have Fragrance ingredient - even if the smell is not as heavy as the one that serum has. Phenoxyethanol is also not a favourite of many people but I prefer to focus on Stearic Acid - similar to serum situation, it's not an ingredient for oily skin but there are also silicones - personally, I have no problems with them in this product but it's your choice. If it comes to the effects it's a moisturizer for a everyday use - it works well with makeup, you don't need to wait additional time. Application process is easy and even if the formula is bit different than serum it's still soothing product. Personally, I would prefer to use eye serum since I see better effect when I use it but this cream is a product which I can consider buying - even if I got my favourite eye cream. Overall, it's a good product. This duo is really an affordable one - small amounts are enough to cover the entire area and moisturize it. 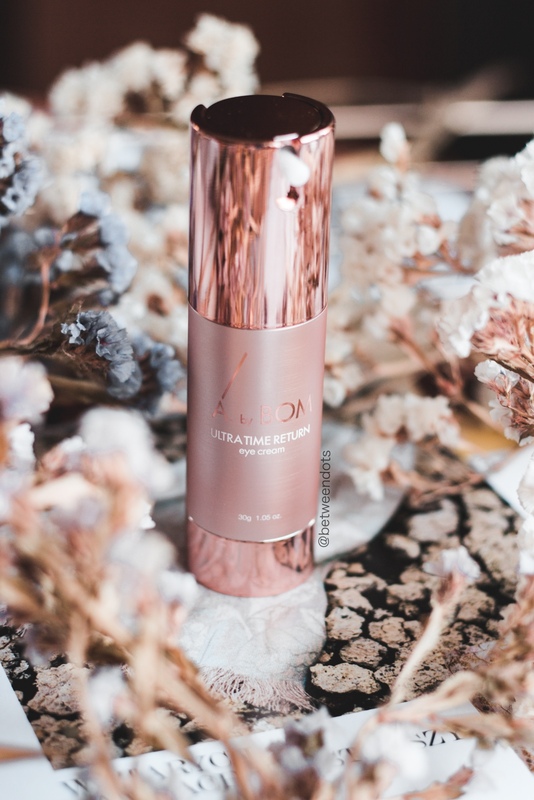 The price might seem high since A. by BOM Ultra Time Return Eye Serum costs $39 for 30ml and A. by BOM Ultra Time Return Eye Cream costs $49 for 30ml but the amount I use daily made me consider this product as affordable. As I said before - if you're younger person choose one of this products, mature skin might prefer combining them. Personally, I'm more likely to buy serum than cream because I feel like it's a product which I can use in many different ways but also the formula fits me better. You can get this duo on bemusedkorea and thanks to bemused korea team you can get 15% off on all A. By Bom products (except special mask set) with code BETWEENDOTS15, this code is valid until December 18th. What do you think about this duo? Have you ever tried any A. By Bom products? What's your favourite eye cream?